The University Senate Committee on Faculty Research (CFR) Grants Program awards three types of funding — summer research appointments, research graduate assistantships, and grants to promote research. 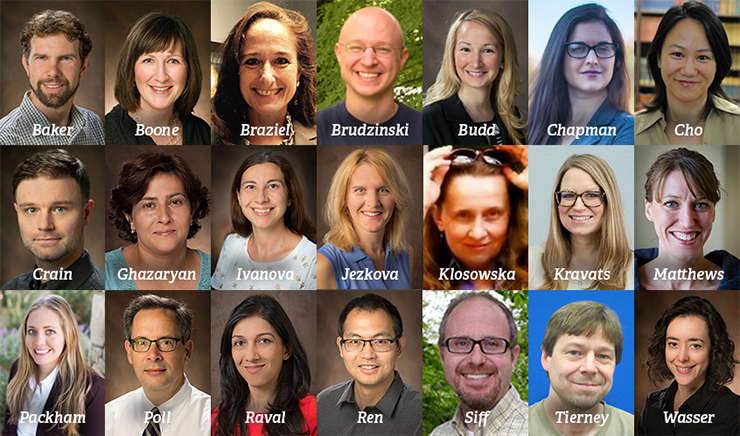 22 CAS faculty have received funding for their research projects for the remainder of the 2018-2019 academic year. Rob Baker (Biology) — Summer Research Appointment, Research Graduate Assistantship, and Grant to Promote Research for "An Evolutionary Development Approach to Abiotic Stress"
Michelle Boone (Biology) — Grant to Promote Research for "Examining the Potential for Exurban Lands to Bolster Regional Biodiversity: How Land Management Impacts Amphibians and Their Pathogens & Parasites"
Jana Braziel (Global & Intercultural Studies) — Summer Research Appointment for "All Too Human? Haiti, Humanities, Human Rights since Aristid"
Michael Brudzinski (Geology & Environmental Earth Science) — Grant to Promote Research for "Testing Predictive Models for Forecasting Human Induced Seismicity"
Kristen Budd (Sociology & Gerontology) — Summer Research Appointment for "Crime, Immigration, and Fugitives: Investigating a Social Justice Issue"
Hannah Chapman (Political Science) — Summer Research Appointment and Grant to Promote Research for "Conceptualization of and Support for Democracy: A Cross-National Analysis"
Yu-Fang Cho (English) — Summer Research Appointment for "The Afterlives the Nuclear Pacific"
Matthew Crain (Media, Journalism & Film) — Summer Research Appointment for "First Watch: The Rise of Surveillance Advertising"
Anna Ghazaryan (Mathematics) — Summer Research Appointment and Research Graduate Assistantship for "Existence and Stability of Traveling Waves in a Model Rioting Activity"
Mariana Ivanova (German, Russian, Asian, & Middle Eastern Languages & Cultures) — Summer Research Appointment and Grant to Promote Research for "Back in the Limelight: German Film Producers' Network and Impact on European Cinema (1945-1990) (Book Project)"
Tereza Jezkova (Biology) — Summer Research Appointment, Research Graduate Assistantship, and Grant to Promote Research for "Identifying Plastic and Adaptive Mechanisms that Allow a Desert Lizard to Adjust to Changing Climates"
Anna Klosowska (French & Italian) — Grant to Promote Research for "Africanism and Colonies in Medieval French Manuscripts"
Andrea Kravats (Chemistry & Biochemistry) — Summer Research Appointment, Research Graduate Assistantship, and Grant to Promote Research for "Molecular Mechanisms of Chaperones in ER Protein Quality Control"
Abigail Matthews (Political Science) — Summer Research Appointment for "Connected Courts"
Analisa Packham (Economics) — Summer Research Appointment for "Evaluating Syringe Exchange Programs in the Wake of the Opioid Crisis"
Trace Poll (Speech Pathology & Audiology) — Summer Research Appointment, Research Graduate Assistantship, and Grant to Promote Research for "Developing and Validating the Transition Pragmatics Interview"
Vaishali Raval (Psychology) — Summer Research Appointment for "Suicide Prevention in Resource-Limited Settings: Developing Culturally Sensitive, Community-Based Solutions"
Hang Ren (Chemistry & Biochemistry) — Summer Research Appointment, Research Graduate Assistantship, and Grant to Promote Research for "Electrochemically Controlled Synthesis of Catalytic Metal Particles"
Stephen Siff (Media, Journalism & Film) — Summer Research Appointment for "Drug War Propaganda: The Political and Intellectual History of Domestic Influence Campaigns in the U.S. Wars on Drugs, 1963 to 1988"
David Tierney (Chemistry & Biochemistry) — Research Graduate Assistantship for "Magnetic Resonance of Spin-Crossover Materials"
Audrey Wasser (French & Italian) — Summer Research Appointment for "On Literary Judgment: Reading After the Death of God"
Be sure to check out the OARS Research News blog from Miami's Office for the Advancement of Research and Scholarship (OARS).